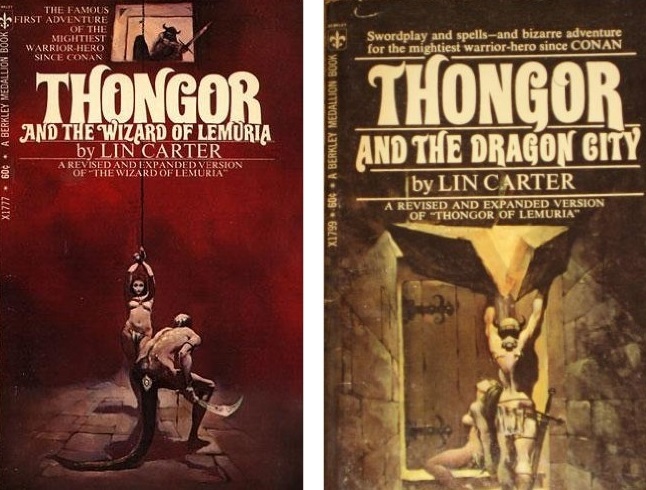 In my continuing quest to find great “vintage” sci-fi and fantasy, I now turn to Lin Carter’s Thongor books. The six volume series takes place in the mythical lost continent of Lemuria. Thongor of Valkarth, the near-barbarian exile, finds himself on one near-death adventure after another across Lemuria. Not surprisingly, he rescues himself a princess and becomes a ruler and warrior of note. Often compared to Conan (which Carter also contributed to), but the stories ring closer to Edgar Rice Burroughs’ tales of peril. Perhaps that’s why I was drawn into this series more than Conan. The first outing is rather brief and straight-forward, but the storytelling in book 2 reaches that Burroughs-level of constant, page turning escapades. I think this kind of quick and fun adventure will, if it hasn’t already, find success with modern audiences. Sometimes authors try a little too hard in their world-building and narrative. Unfortunately, this series is a short one. Sometimes – if not quite often – readers want to be swept away into another world full of larger-than-life, sword-swinging heroes facing unimaginable peril and rescuing their beautiful women. Thongor is all of this. Politically incorrect? Perhaps to some. Fun and entertaining? Most certainly. Thongor at the End of Time, which I still have after all these years, is a bit different. It becomes a metaphysical journey – Carter went beyond the usual sword fantasy tropes and motifs. Carter was a fantastic editor & anthologists. he gave my generation of fantasy readers a marvellous introduction to the classics of fantasy literature & pulp fantasy. His short pieces often worked better than his longer narratives. He seemed to have trouble going past the formulas and codes & conventions of the pulp fantast genre.